In 2000, the world made a promise to reduce deaths among children under-five by two thirds by 2015, compared to 1990, the benchmark year for the Millennium Development Goals (MDGs). 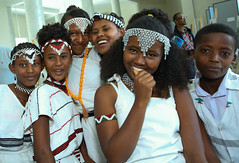 With less than 460 days left until the deadline, great progress has been made in Ethiopia. It is worth remembering that, just last year, Ethiopia achieved the child survival millennium development goal (MDG 4), three years ahead of time by cutting under-five mortality from 204per 1000 live births in 1990 to 68 per 1000 live births in 2012. New UNICEF figures published last week in the Committing to Child Survival: A Promise Renewed report, show that Ethiopia continues to make progress in preventing deaths among children. Presentlythe number of under-five child deaths has fallen to 64per 1000 live births and more children are living to celebrate their fifth birthday. Ethiopia’s experience and success can show world leaders some important lessons. The first lesson is about leadership and country ownership. Governments need to lead and countries own the commitment. It may seem obvious but, despite much rhetoric, too often development priorities are still determined in Geneva or Washington rather than by the governments most concerned. By incorporating the MDGs into its national development plan, the Growth and Transformation Plan, and setting ambitious, national targets, the Government of Ethiopia has demonstrated strong leadership and country ownership, and consistently backed its decisions with high level commitment. Second, evidence needs to determine policy choices. About 10 years ago, in order to address the increasing urban-rural gap in access to health services, the Government of Ethiopia launched the Health Extension Programme. The package of interventions wascarefully tailored to the major causes of mortality and morbidity, with epidemiology determining the priorities. The early years were challenging, because delivering services to more than 80 million people in a vast and diverse country is not an easy task. However, year after year, the system has becomestronger and stronger, presently deploying over 38,000 government salaried rural and urban health extension workers. Starting from a focus on basic health promotion and disease prevention, incrementally high impact curative services have been integrated into the programme. Side by side, multi-sectoral agendas have been incorporated to address root causes of childhood disease, such as food and nutrition security and water and sanitation. Community-based treatment of diarrhoea, pneumonia, malaria, severe acute malnutrition and, most recently, new-born sepsis and the inclusion of new vaccines are all now central components. That leads us to the third lesson: that governments need to resource the plan and do so at scale. By putting the 38,000 mainly rural women on the government payroll, the government not only backed up its decision to bring health services to the doorstep of its rural people with real resources, but also sent a strong message that these health extension workers (HEWs) were here to stay. Sustainability was virtually guaranteed. The HEWs have since become a cornerstone of the health system. 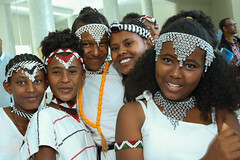 These young women represent the true heroes, or more precisely heroines, of this MDG story. Prompted and encouraged by the success of the Health Extension Programme, Ethiopia has recently embarked on a new social mobilisation scheme which is referred to as Health Development Army (HDA). HDA is a network of women volunteers organised to promote health, prevent disease through community participation and empowerment. The HDA has effectively facilitated the identification of local salient bottlenecks that hinder families from utilising key Maternal, Neonatal and Child Health Services and to come up with locally grown and acceptable strategies for addressing ongoing issues. To date, the Government has been able to mobilise over three-million women to be part of an organized HDA. But Ethiopia could not have done this alone. The fourth lesson is that international partners need to support the vision. In the concerted effort to save children’s lives, partners have played a key role. 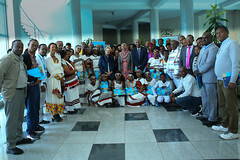 The bilateral government donors, the World Bank and UN agencies, NGOs and civil society, philanthropic foundations, and the private sector, have all played a key role through their funding, programmatic, operational and technical assistance, and their belief that Ethiopia could achieve its goals. Thanks to these coordinated efforts, Ethiopia has slashed child mortality rates. In 1990, 1 in 5 Ethiopian children could be expected to die before reaching the age of 5. Today, the figure is closer to 1 in 15. Well over 1 million children have been saved during this period. While we deserve to celebrate our accomplishment, we also need to remind ourselves that we have a long way to go, because close to205,000 children under five years of age are still dying every year and nearly 43 per cent of these children are dying in their first 28 days of life. This means that more than 500 Ethiopian children die every day, mostly from preventable diseases. We also need to further address disparities in the delivery of services between rich and poor, urban and rural, pastoralist and agrarian areas, able and disabled and women and men. We also have to work hard to increase the quality of services rendered. But Ethiopia has shown that a poor country, once only associated with famine and conflict, can become a leader for global health and development. The country is on a trajectory to bend the curve and achieve a major goal of “A Promise Renewed”, which is reducing the level of child death to 20 under-five deaths per 1000 live births by 2035.​ For Africa, there are no longer any excuses.